Another thing us housewives do is put a bit of effort into maintaining the schoolgirl figure. There are various means of doing this, pills that you get from clicking on a Facebook ad, eating disorders, diets you find in magazines. My preferred method is to eat sensibly and get regular exercise. I know it sounds crazy, but it seems to be working for me. Last school holidays we went on the family ski trip. On the second last day, with the sun shining and everyone feeling like they were a pretty fantastic skiier, we took the Moose down a black run. My husband recklessly turned his head on the way down to see how he was doing and took a fairly predictable tumble. I attempted to stop gracefully beside him, but failed. Instead I cartwheeled over the top of him and, to cut a long story short, sprained my ankle. This has cut out quite a large part of my regular exercise, as I still can’t walk very far without it swelling up. All that is left to me is cycle class. There are three cycle class instructors at my gym. The first is enthusiastic, but uninspiring. I mainly do his class to marvel at the amount he sweats. I feel that they should put a tarpaulin underneath him so they can reconstitute him afterwards. The second is a hyperfit woman in her fifties, all zip and gristle and black eyeliner. I very much enjoy her classes, but the best of all is Dmitri. I did Dmitri’s class today. He’s the kind of short, stocky Mediterranean type that I’d always have a crush on in high school. It’s not that which makes his class the best, in fact I’m not really sure what it is. All I know is that it is in Dmitri’s class that I’ve come closest to vomiting like they do on the Biggest Loser. I probably shouldn’t have mentioned this to the young lady next to me, as she kept shooting me startled looks every time I coughed. There’s a lot of sprinting sitting down and sprinting standing up, and giving it one hundred percent, and it seems to be over fairly quickly and I’m never quite sure that I’m not going to sink quivering to the ground after dismounting. He manages to run the entire class without once saying “woohoo”. The real measure of his class is that when I go out into the carpark, I can’t remember where I’ve parked. And when I do find the car, I attempt to open it with my gym card. Like so many things in my life, going to the beautician isn’t really one of those things I choose to do, it just happens. The first time I went to one was to redeem a gift certificate. It was a fairly pleasant experience, but the beautician went broke shortly afterwards. There was another one that my sister booked me into, which was also pleasant, but extremely tedious. She also went broke shortly afterwards. There have been a few in between that I’ve just drifted into, one who commented on my extreme old age, one who was a bit over ambitious getting my bikini line even, one with scary multicolored talons. Today’s appointment was set up by my hairdresser. He’s insisting on dying my hair at my next appointment, unable to stand the kaleidoscope of ginger, blonde, dark brown and grey that is happening on my skull any more. I mention that when he dyes my hair, my eyebrows look a lot lighter. I’m actually in fear of them disappearing altogether, like my mother’s. My niece has suggested that perhaps Grandma got a big surprise one day and they just flew off. It could happen to me, I’m easily surprised. Apparently you can get your eyebrows dyed. Also your eyelashes. So Gary has organized a young lady in Paddington to call me and book me in to her emporium of such mysteries. Paddington. That’s in the eastern suburbs. When people find a parking spot in the eastern suburbs, they pop into a dodgy doctor to get a disability sticker so they can leave their car there for the rest of their Ives. Then they bequeath it to their children. So I was foolish to venture there without my GPS enabled iPad, and even more so when I realized there was no map in the car. Fortunately my patient husband was able to talk me from the skip I’d parked beside to the emporium over the phone. Once again, it was all very pleasant, though I hadn’t realized eyebrow shaping was one of the arts. I didn’t even really want my eyebrows shaped, I like them way they are, they’re rather sardonic. I just don’t want them disappearing in direct sunlight. She was very lovely, spoke English, didn’t draw blood at any point, and was very gentle with my eyebrows. She also dyed my eyelashes, which I knew was a beautician thing because I’d accidentally had it done at my very first gift certificate visit. I hope her finances are in order. I think they look a little dark, I shall have to spend the next couple of days being very cross to use them to full effect. Apparently they’ll lighten a bit when I wash my hair. Nobody has noticed them, except my smirking husband, so they can’t be too savage. I wonder if it’s something I’ll do again? Perhaps I should just buy a dark brown Sharpie, it’d be much cheaper. Today I had the quintessential housewife experience. The ENJO party. Not at my place, because I know my strengths and one of them isn’t hosting parties. There was only one other housewife there, everyone else was in gainful employment of some description, some even skiving off work for the occasion. For those that haven’t attended one, an ENJO party works exactly like a Tupperware party, only with cleaning products. We straggle in, are greeted by the dog, stand around awkwardly for a bit until everyone has a hot beverage, then we sit down and get stuck in to discussing the school that our sons all attend. Because they are at a private school the discussion is mainly about what a fantastic time our sons are having and what legends their teachers are, with a little bit on sporting choices and whether last year’s school captain will be Prime Minister someday or just Emperor of the World. He was that kind of kid. We do eventually move on to the products. The ENJO system consists of a cleaning cloth with a matching drying cloth, tailored for various cleaning situations. In your kitchen you wet the kitchen glove, wipe over your greasy stove, then dry it with the kitchen drying cloth and stand back in amazement, because they really do work this way. You never need to buy any cleaning products ever again. Because I am a housewife of long standing, I already have most of these cloths and am mainly there for moral support. They have moved into soaps, so I get some hand wash – which emerges from the pump in enticing little puffs of foam, and dish washing liquid. They also have little circular make up removal pads, which we try by applying lipstick to our hands then wiping it off with the wet pad. I’m utterly sold, despite the fact I’ve been on the same pot of Ponds cleanser for about ten years. I may have to start wearing makeup. A jolly good time was had by all, and arrangements are made for the next party, because that’s how these things work. I’m going to have to go to that one because I want to see if the sales lady is going to wear another ENJO coloured dress. Most recipes that I tweak with only usually need an adjustment in the type of sugar, or a bit more or less butter, or something fairly minor for me to add it to the collection. Not this one. I had been on the hunt for the perfect lemon slice for some time, but the Women’s Weekly one was just adequate, the Donna Hay one a bit gloopy and I didn’t like the base. The recipe I lay before you today is almost right. Possibly still a little gloopy, but not unacceptably so. The recipe for the base I unashamedly stole from a fascinating book called The Good Cookie, by Tish Boyle. This book was given to me by my worthy and esteemed brother-in-law, who also happens to be a B grade celebrity chef. If you’re the kind of housewife that lounges about the place watching telly and eating chocolate, you would have seen him on daytime TV. His celebrity status should be much higher, as he is an excellent chef, festooned with hats. Place in a bowl one and a quarter cups of flour, 125 grams of room temperature butter, one quarter of a cup of brown sugar and two tablespoons of finely chopped crystallized ginger. The ginger is optional, but try it with, I love it. You could possibly use the stuff in syrup in a jar if you can’t find the sugar coated crystallized stuff, but gosh you’ll be sticky after chopping it up. Get in there with your hands and rub the butter in until what you appear to have is a bowl of breadcrumbs. Tip this into your roasting pan line with baking paper (mine is 20 by 27 cm) and press it down. Bake in a 180 degree oven for about twenty minutes, or until it is starting to colour on top. Meanwhile, you’ll be making the topping. Separate five eggs into two different bowls, you’ll be using the yolk component. You could just use three whole eggs if you’re not planning to make friands at the same time in the other bowl. To the five egg yolks add one and a half cups of caster sugar, one third of a cup of lemon juice, one quarter of a cup of plain flour, half a teaspoon of baking powder and the zest of two lemons. Obviously lemons come in a wide range of sizes, so let’s say two moderately small ones. I zest citrus fruit a lot and use the Microplane for it, it’s also super for grating nutmeg and am I starting to sound like Martha Gardner? I’d recommend growing your right thumbnail long if you’re going to use the Microplane regularly, emery boards are cheaper than band aids. Whisk that lot together and pour it straight onto the base you’ve just taken out of the oven. It will make a pleasing sizzling sound. You don’t really have to do it straight away, that’s just how it worked out today. Stick it back in the oven and bake it for a further twenty minutes or so. You want the top fairly well coloured to make sure that it sets when it cools down. Don’t even think about cutting it up before it has cooled down. When you’re piling it into the Tupperware you’ll have to separate each layer with a sheet of baking paper, because they do tend to stick together. One slight disadvantage to this recipe is that if your kitchen is on a lean because your house is slowly sinking into the swamp, there will be one side slightly more lemony than the other. But who could be bothered turning it halfway? A few weeks ago we turfed our eldest, the Moose, out of his bedroom to accommodate two little girls from my daughter’s school’s Armidale branch. He didn’t have any choice in the matter, but was very gracious about having to sleep on the lounge with a snoring dog on his chest for three nights and being giggled at every time he opened his mouth. As a reward I offered to take him and his comic book loving friend the Care Bear to an event called Heroes and Villains. It was held at that world of entertainment, Penrith Panthers. That would be in Penrith. Which is a little under sixty kilometres from the Care Bear’s house. Two of its headline attractions were the guy who does Squidward’s voice in Spongebob Squarepants and a chap who was a Kaos agent in the original Get Smart, making him approximately ninety seven years old. It was a jolly gathering of like minded folk. There were the beyond cliched obese guys with ponytails. The women who cut their own hair. More people than I’d expected came dressed up, as characters that I didn’t recognize. I did recognize a Tom Baker scarf, a Matt Smith lookalike and a sadly accurate Sylvester McCoy. Why would you pick that Doctor?? There were also several people wearing a white bag over their head topped with a fedora hat. It could well have actually just been one fellow who over around a lot, I don’t know. To the fellow in the silver jumpsuit, you may want to rethink boxer shorts as the undergarment of choice for whatever superhero you were. We also spotted Liam Neeson. After a bit of discussion we agreed that he’d need to be a foot taller and not eating a pie to truly fool us, but he was a terrific Qui Gon Jinn. 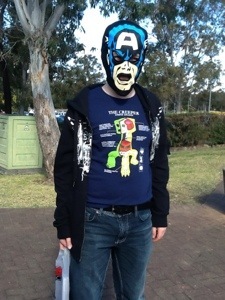 There were only about twenty stalls, so I got to go around about sixty three times before the boys had had enough, each time assiduously avoiding eye contact with the folks at the Doctor Who Association of Australia who were handing out jelly babies. They were a bit close to the bone for me. My fair of choice is usually a craft fair. You would think that a gaggle of elderly ladies eagerly poking at the latest line in Japanese print fat squares would be more flatulent than this cheery gang of anime fans. You would be wrong. As we were leaving we passed three Storm Troopers who paused to glare at the Care Bear. He look at me, little horrified, and I said “these aren’t the droids you’re looking for”. He smacked himself on the forehead, realizing he’d missed the opportunity of a lifetime. I think he’s going to save that one up for the next Supernova. Because they never would have heard that one before. This one is still a work in progress. I asked the Horror what he’d like for afternoon tea and possibly in his lunchbox on Monday. He had to consider for quite some time, and finally came up with raspberry slice. He had reservations about taking it in his lunchbox because it has a tendency to shed, and he can be quite a finicky child. However he thought it probable that it would all be eaten on the weekend and the issue would not arise. Using your hands, rub together 125 grams of nice butter with 1 1/2 cups of flour and 1 teaspoon baking powder. You don’t have to do it to crumb stage, but fairly well rubbed in. Mix in an egg. Gather dough into a fairly crumbly ball and dump into a lined roasting tray, mine is 20 by 27 cm and I only just get enough coverage. Press it down into a reasonably well packed layer. Bake for 10 to 15 minutes, or until just starting to change colour. 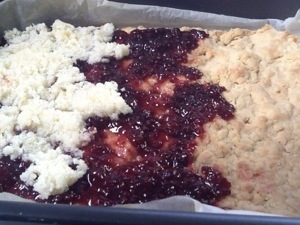 While that’s baking, mix together 1/2 cup caster sugar, 1 egg and 1 cup desiccated coconut. This is an occasion for using the expensive coconut you bought from Honest to Goodness at the markets on the weekend, it makes a noticeable difference. You don’t have to wait for the base to cool before you spread it with raspberry jam, or any other jam you may be trying to get rid of. It’s the major flavour, so I don’t recommend the Home Brand plum jam. You have to slice that stuff anyway. Hoik on the coconut mixture with a fork and spread it out relatively evenly. Bake it at 180 C for a further 25 minutes, or to taste – I like it fairly brown and crunchy on top, but you may not. Wait until it’s completely cook before cutting it up, although it’s probably best to nip a bit off the corner while still warm to make sure it’s not poisonous. The picture is the slice under construction. I’m still not terribly happy with the base, it’s a touch too crumbly. It holds together OK, but I’d like something a bit more uniform, without being tough. I’ll let you know when I work it out. In a bowl, mix together 2 cups of flour, 1 1/2 teaspoons of baking powder, 3/4 cup of caster sugar, 3 eggs and your flavouring. My family’s favourite is hazelnut and vanilla, so I’d add a cup of whole hazelnuts and 3 teaspoons of vanilla, because I make my own vanilla and it’s a bit weak. If you used bought vanilla, use 2 teaspoons. My personal favourite flavouring is 1/2 cup cranberries, 1/2 cup shelled pistachios and 1 teaspoon of vanilla, but nobody else likes those because they are ignorant Philistines. The mixture will be a bit dry to start off with, but get in there with your hands and knead it together until you have a smooth dough, apart from the nuts. If you’ve used large eggs you may need a bit more flour, the dough should be quite stiff. Form the dough into two logs and place them on a lined baking tray. You can amuse yourself by making square or triangle cross section logs if you want to pretend you’re helping out at preschool. Bake at 160 degrees C for about thirty five minutes, or until they’re starting to go a bit golden. After you take them out of the oven, let them cool completely. What I’d then strongly recommend is wrapping them in a tea towel, putting them somewhere that the ants can’t get them and leaving them overnight. Then you can cut them with a sharp knife, once again you can choose to amuse yourself by seeing how finely you can slice them, but I like them on the robust side. Arrange them on lined baking trays and bake at 160 degrees for about ten or fifteen minutes – until they’re just starting to colour. Cool completely, then stick them in Tupperware. I like this recipe because it doesn’t require you to mess about with egg whites, which I avoid as much as I can. 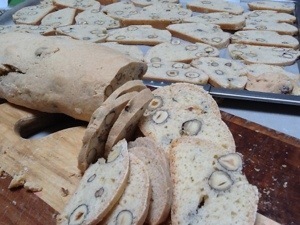 I’ve tried biscotti made with egg whites, and they are more delicate, the kind of thing you’d serve with coffee when the boss came around. But these are destined for the lunchbox, because apparently at high school you can bring nut products so long as you refrain from licking anyone with an allergy. There comes a time in every housewife’s life when she realises she’s behind on the birthday presents. And so it was today, when upon awakening I realised I must immediately go and purchase four presents. Immediately after making lunches, dropping kids at school, having breakfast, entering the orchestra cheques into the choir accounting program and going to the physio. The presents are for a niece, a nephew, a Grampa and Muffet’s brainy friend. The Moose tells me that brainy kids get tired of receiving science packs for their birthdays but has nothing constructive to offer as an alternative, so I ignore him completely and head straight for Terrific Scientific. I pick up two packs, one for the brainy friend and one for the nephew who has shown a vague interest in science that must be pushed along. Then I take a peek in the store next door. It’s one of those shops full of cushions, and pink and gold throws made by unemployed yaks, and jingly strings to hang on the curtain to startle the cat. Who shops there? How on earth do they stay in business? I can only imagine buying something there as in a last minute rush present for a husband’s secretary or a grandmother-in-law or something, and how often is that? Yet there must be people out there who stand with a hand on one hip and say to their partner “you know, what our house really needs is a verdigris donkey. We could put it next to our collection of oversized candlesticks”. Next door to that was my next stop – coffee. You can’t shop uncaffeinated. This turned out to be a hipster cafe. I could tell because the (male) baristas were, reading from left to right, bearded with Buddy Holly glasses, dark and thin with a black beanie and a large hole in the ear, tattooed with long red hair tied in a messy bun. Also the counter was constructed from mismatched dresser drawers. I’m sure there’s a hipster term for that kind of thing. Ironic?, except it isn’t. Ecocycled? The word that sprang to my mind was rickety, but the coffee was good. I thought I’d get the niece a funky item of clothing for her entry into teenagehood. You know how people talk about having a great novel in them? Or a long distance runner, or fashion designer or something? Well inside me is a crazy cat lady, and shops like the Tree of Life are very bad for that side of me. I did try on a gorgeous purple velvet jacket with a lace collar and through an enormous act of will managed not to buy it, even though it was on sale. I walked out of there with only a crocheted top in a colour the Muffet tells me is my niece’s favourite, so a success all round. To finish it off I found a rather tailored grey cardy for Grampa, the man has really got to stop wearing beige. Now I have to talk the kids into wrapping my haul. It’s quite possible that I should have bought wrapping paper while I was out. But that coffee just wasn’t strong enough. 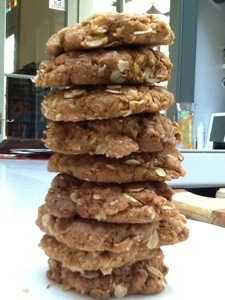 Apparently I make quite a fine Anzac biscuit. I should hope so, I worked on the recipe for ages. My family likes it crunchy and dark, so here’s what I do. Melt 125 grams of butter and a tablespoon of golden syrup in a small pan. I use a small Vision pan, it appears to made of toughened glass and I snaffled it from my Nanna shortly after she went into a nursing home. I know I’m a scientist and everything, but microwaving stuff gives me the collywobbles, so stovetop it is for me. Meanwhile mix together 1 cup plain flour, 1 cup of oats, 3/4 cup desiccated coconut, 1/2 cup white sugar, 1/4 cup brown sugar, and 1 teaspoon of vanilla essence. In a measuring cup or something mix 1 and a half teaspoons of bicarbonate of soda with 2 tablespoons of boiling water, then tip into the pot of melted butter. Stir it around until it fizzes up, then tip it into the bowl of dry ingredients and mix. 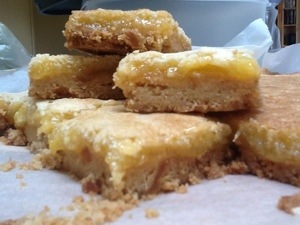 It’s quite a dry mixture, but you don’t want it too crumbly. On a dry day you may need an extra 5 grams of melted butter, it can really make a difference. Squash walnut sized lumps onto a lined baking pan and bake in a moderate oven until really quite brown. Fifteen or so minutes, just keep an eye on it. Let them cool completely before packing them into Tupperware so that they stay crunchy. I think it makes a difference to use a nice butter. I use and recommend Harmonie Danish butter, not because it’s organic (it has travelled from Denmark, totally negating its environmental credentials), but because you can actually taste the difference. You can recommend some Australian organic butters to me, but all the ones I’ve tried are on the cheesy side and are best in savory recipes. I’ve also tried using organic coconut and oats from Honest to Goodness, but that just makes me feel good, you can’t taste them. You can tell in a raspberry slice, but that’s a whole other post. So that’ll weigh down the lunch boxes for a couple of days.